Millions of pilgrims have arrived in the megalopolis today for perhaps the most important religious holiday in Mexico--Our Lady of Guadalupe Day. 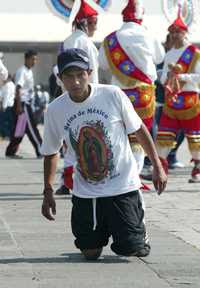 The Virgen de Guadalupe is often called the "Queen of Mexico" because of nation's devotion to her. Celebrations here began earlier this week as devotees from all over the nation and U.S. made the trek to the Basilica and Tepeyac hill, where she first appeared in the 1500s. 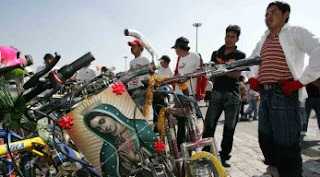 At about 11 p.m. last night, Jeremy and I spotted dozens and dozens of pilgrim cyclists --with framed images of the Virgen de Guadalupe tied to their bikes --pedal down a major southern Mexico City road. People on the side of the road handed out things to the cyclists, which I believe was food or water. It was a beautiful sight to see. The Mexico City daily El Universal reported today that a group of about 150 cyclists pedaled here from the state of Morelos. Perhaps it was the same group we spotted. It is tradition on the morning of the 12th (around 6 or 7 a.m.) for devotees to gather and sing "Las Mañanitas" to the Virgen, which is the song sung on a person's birthday. Firecrackers have been popping non-stop since yesterday evening. At first, this seems a little jarring since the loud and roaring noises sound more like a battle zone, but after awhile you get used to it. I even managed to sleep through the night. The devotion to the Virgen de Guadalupe has always been strong in my family, mainly because of the strong devotion my maternal grandmother had to her. This sentiment has been passed down, and remains even more special because my mother was also named after the Virgen de Guadalupe. 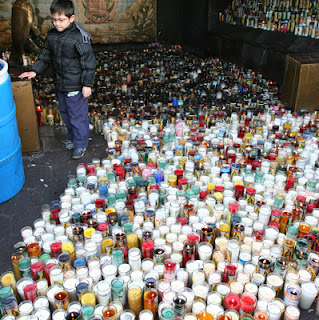 To learn more about the Virgen de Guadalupe, click on the blog title above.